Terra Siciliae, a new line of Pecorino cheeses, has arrived! Valoroso is proud to introduce Terra Siciliae pecorino cheeses to our stores. The unique allure and complex flavours of Italian pecorino cheese is undeniably linked to the serene environment in which the sheep are raised, and the wholesome grasses on which they feed. 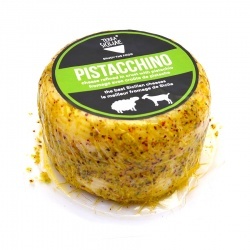 A great pecorino cheese contains all the layered scents and heady aromas of the open pastures where the sheep graze. The delicate flavour of these Sicilian Pecorino is all in the ageing process: Terra Siciliae Pecorino typically undergoes a stage of light salting by treating the heel of the wheel with salt, then it is finished with the aromas or left plain and left to mature for 20 days, all the while being rigorously checked for maximum quality and goodness. Terra Siciliae is a fresh, modern brand with strong links to quality and authenticity Terra's whole production process is artisan, and begins with the milk sourced directly on the farm, from livestock fed on natural pastures and first rate hays, according to the principles of sustainable farming. Made from mountain milk, produced in uncontaminated areas, this cheese is born of the union of nature and tradition.